The Swingline DS22-13 Strip-cut Departmental Paper Shredder is the smart choice for both quality and value. Ideal for moderate shared usage, the Swingline DS22-13 employs Non Stop Jam Free technology, delivering consistent worry-free performance. Ideal for moderate shared usage; the DS22-13 shreds CDs, credit cards, staples, paper clips and of course is able to strip-cut shred up to 22 sheets at once into a 13 gallon bin. Annoying paper jams are a thing of the past with the DS22-13's overfill warning feature. The DS22-13 stops and an indicator light glows red when too much paper is inserted. Simply remove excess sheets until indicator light turns green to continue shredding. No mess made, no time wasted. Able to run in continuous duty mode for long jobs, the DS22-13 provides you with an auto-shut-down feature to conserve energy. Swingline offers a generous manufacturer warranty in the form of a 2- year warranty on machine and lifetime on cutters. I really like the shredder. It does not jam and works fast. However, the storage basket holds hardly anything and the shredder will not run until you have squished down the shreds or emptied the basket. it will also not run if the basket door is open, so you can't put a larger trashbag underneath. The shredder duty consists of shredding 2 passes, then opening the door to either squish down or empty. It makes the process very time consuming. Hi! Adam here with the new DS22-13 Strip-Cut Shredder from Swingline. Choose a shredder that is more than just tough. The Swingline DS22-13 Strip Cut Shredder is the right choice for quality and value. The sheet capacity of the DS22-13 is 22 sheets and the waste bin holds 13 gallons of shreds. It can also shred CDs and credit cards. Non-stop jam-free technology delivers hassle-free performance. The continuous duty operation lets you easily power through the biggest jobs. And the Swingline DS22-13 is durable, reliable and designed to withstand heavy, long-term use. They're even eco-friendly by means of an energy saving power save mode with auto-wake up and paper bags for recycling. The DS22-13 comes with a lifetime warranty on the cutting blades and a two-year warranty on the machine. These features and more make the DS22-13 the right choice for your security, power and productivity shredding needs. 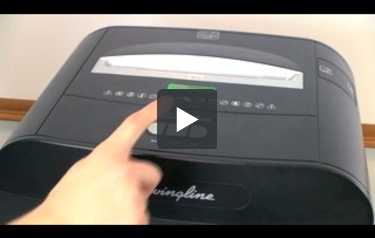 Swingline is a company that's famous for its high-quality staplers and they're now becoming known for making first-rate shredders. One of their devices is the DS22-13, a machine that's suitable for everyday shredding in busy offices. What follows is a rundown of the shredder's strengths and weaknesses. Check them out so you can decide if the DS22-13 is the right shredder for you. This shredder can process up to 22 sheets at a time. It can also shred CD's, credit cards, paper clips, and staples. The machine has a 13-gallon bin so you'll be able to shred a lot of documents before needing to empty the bin. The DS22-13 is a continuous-duty shredder so you'll be able to use it for larger shredding jobs without any problem. This machine can shred up to 16 feet of paper for minute so you'll be able to get rid of your documents quickly. This shredder has the ability to shut off automatically. This is a terrific feature that will help you conserve energy and it also prevents the motor from overheating. The DS22-13 is one of Swingline's jam-free shredders so you'll be able to shred as much as you need to without any hassle. Also, the machine operates quietly so others won't be disturbed when you shred your documents. If your work area isn't very large, you should still be able to find room for this shredder. Its dimensions are 24" (height) x 19" (width) x 14" (depth) so it really doesn't take up much room at all. Finally, the DS22-13's cutters are covered by a lifetime warranty. The entire machine is backed for 2 years. Warranty coverage doesn't get much better than this. The DS22-13 is a strip-cut shredder with a Level 2 security rating. While this rating is suitable for everyday shredding, it won't cut it if you need to shred highly confidential documents on a regular basis. All of your shreds will end up in the waste bin, which could make recycling a pain. You should consider shredding different items separately to make waste disposal easier. Although the DS22-13 can shred credit cards and CD's, it can't take care of floppy disks and DAT tape. However, there are some great multimedia shredders available to take care of those needs. Overall, the DS22-13 is a solid strip-cut shredder that would be a great choice for offices needing a machine for everyday shredding. This machine has some great features such as the ability to shut off automatically and jam-free performance. The device shreds a lot quickly so you can move on to other things in a hurry. Also, the DS22-13 is backed by 2 great warranties so you can have piece of mind. Before investing in this machine, you'll want to consider its security level and determine if it will fit your needs. If it does, you'll love shredding with this device, so be sure to check it out. Entry Width 10" 10" 10" 9"
Shred Size 1/4" 5/32" x 1 3/4" 5/32" x 1 3/4" 1/4"